The evolution of communication technologies, along with its challenges, has been of interest to John Daigle for a long time. Now the University of Mississippi Distinguished Professor of Electrical Engineering is leading some undergraduates in the study of how Bluetooth low-energy advertising is altered by interferences. 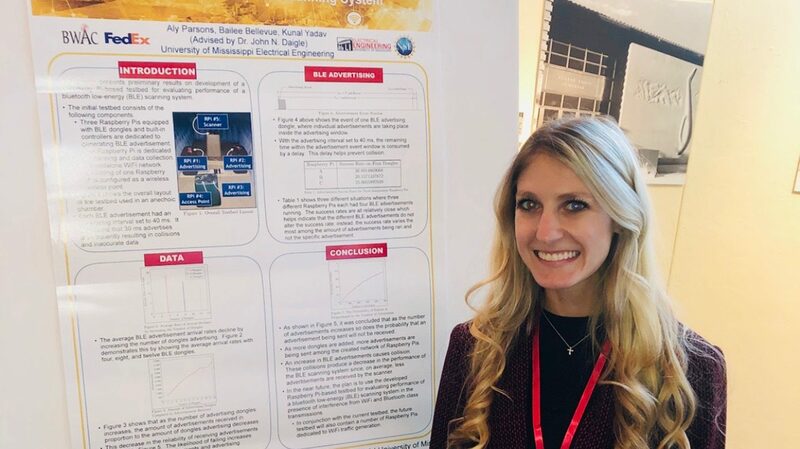 Daigle is the principal investigator of “Analysis of Bluetooth Low-Energy Beacons.” Fellow researchers include three senior electrical engineering majors: Alyson Parsons of Bowling Green, Kentucky; Kunal Yadav of Saptari, Nepal; and Bailee Bellevue of Mandeville, Louisiana. George Humphrey, a telecommunications graduate student from Ridgeland, is also part of the team. The overall long-term objective of the research is to gain a thorough understanding of the impact of self-interference and mutual interference among three types of systems that operate simultaneously in the 2400 megahertz range. The three systems are WiFi, Bluetooth Classic and Bluetooth Low Energy. “The current focus of the work is to gain a working knowledge of how a BLE advertising system works in the presence of BLE interference,” said Daigle, a Life Fellow of the Institute of Electrical and Electronics Engineers. When Daigle asked Parsons if she would be interested in being an undergraduate research assistant specifically analyzing BLE beacons, she jumped at the opportunity. In addition to participating in design and execution of experiments, Parsons’ particular role on the team is also to verbalize and document the group’s thoughts and findings through an application called LaTeX. The undergraduates presented a poster paper on measurement results they obtained at the November meeting of the NSF Broadband Wireless Access and Applications Center in Tucson, Arizona. Humphrey presented a poster paper that showed the results of his simulation model of a BLE system. “While at the conference, I was able to present the testbed created and the findings discovered by our team alongside Dr. Daigle,” Parsons said. “This testbed evaluated the performance of a BLE system scanning beacons. We used a total of five Raspberry Pis (transmitters similar to cell phones), which included one for scanning the beacons/advertisements being sent simultaneously by BLE dongles on the four remaining Raspberry Pis. Recipient of the EE department’s 2018 Leonard Tsai Scholarship Award, Yadav became part of Daigle’s research group through the professor’s Theory of Control Systems course in spring 2018. Yadav said he primarily worked on the programming part of the project. The BLE and Wi-Fi coexistence issues being studied by these students under the guidance of Dr. Daigle are an interesting practical problem that would be of value in industrial settings, said Ramanarayanan Viswanathan, chair and professor of electrical engineering. “Students will learn both theory and its application to this important technology,” Viswanathan said. The students are already anticipating expanded research with Daigle.